Seductive Poison has been published in Italy, France, Australia, Germany, Thailand and United Kingdom. In this haunting and riveting firsthand account, a survivor of Jim Jones’s Peoples Temple opens up the shadowy world of cults and shows how anyone can fall under their spell. 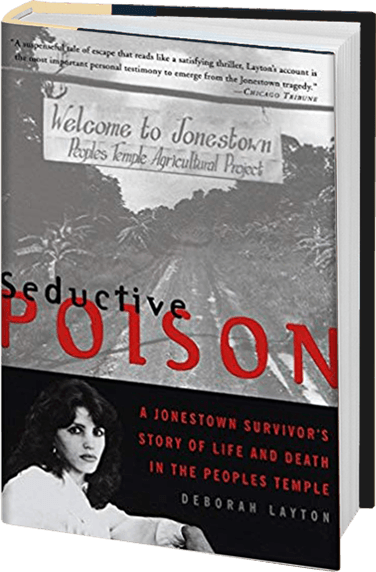 A high-level member of Jim Jones’s Peoples Temple for seven years, Deborah Layton escaped his infamous commune in the Guyanese jungle, leaving behind her mother, her older brother, and many friends. She returned to the United States with warnings of impending disaster, but her pleas for help fell on skeptical ears, and shortly thereafter, in November 1978, the Jonestown massacre shocked the world. Seductive Poison is both an unflinching historical document and a suspenseful story of intrigue, power, and murder.